The presence of owner Vladimir Romanov brought out the best in Hearts as goals from Andrew Driver, Andrius Velicka, Ibrahim Tall and Christian Nade ensured an emphatic victory which was much needed having gained just one point from their previous three SPL matches. Energetic in midfield and lethal in attack, the Jambos played at a high tempo throughout the 90 minutes as they leapfrogged Aberdeen into sixth place. Fine displays from Michael Stewart and Eggert Jonsson in the heart of midfield helped Hearts force their way back into the top half thanks to their biggest win over Aberdeen since 1999. Aberdeen came into the match having been involved in UEFA Cup action during the week, securing a draw against Lokomotiv Moscow. There was a sloppiness about the visitors in the opening quarter however, and Hearts were able to exploit this with two goals in the first 14 minutes. Hearts started the match at a brisk tempo and were in front after three minutes thanks to pressing play which forced Aberdeen to make a catalogue of errors. Driver was involved in the build-up, then Nade took advantage of mistakes from Ricky Foster and Zander Diamond before prodding the ball towards goal. It wasn’t going to cross the line, however, until Driver raced towards the far post and poked home his fifth goal of the season off the base of the woodwork. Although the early exchanges were hectic rather than fluent, Driver and Robbie Neilson combined at brisk pace down the right flank after 13 minutes and forced a corner. The kick was taken short and Driver aimed a cross towards the back post. Dons goalkeeper Jamie Langfield should have gathered the ball, but under pressure from Nade, the chance fell to Velicka who buried it from close range with his left boot. Hearts could have added a third goal before half-time when Nade gathered a cross from Velicka with a delicate first touch. Having made room for himself, though, the big striker shoved the ball wide from close range. They were to regret that miss seven minutes before the break when Jeffrey De Visscher, who looked half a yard offside, cut inside from the right in the 38th minute without being closed down by Jose Goncalves. His angled shot was struck with menacing accuracy and eluded the grasp of Steve Banks to hand the visitors a lifeline. A wild challenge by Derek Young on Neilson, which earned the Aberdeen player a yellow card, forced the Hearts full-back to hobble off. Marius Zaliukas came on to play in central defence with Tall switching to right back. 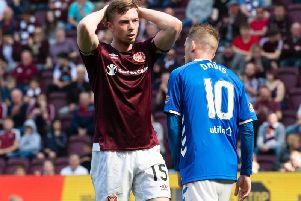 After a rousing opening spell, Hearts could have been out of sight, but now faced a test of nerve to retain an advantage. Aberdeen were quicker to the ball and more adept at denying Hearts space in the second half. Even so, the home side went further ahead in the 54th minute after De Visscher fouled Nade. Stewart proceeded to send a curling free-kick into the heart of the penalty box where Tall rose above the rest to glance a header into the corner of the net. The home side rounded things off after 62 minutes when Nade, at the second attempt, curled a shot past Langfield. Hearts: Banks, Neilson, Goncalves, Tall, Stewart, Berra, Driver, Jonsson, Nade, Velicka, Ksanavicius.